Your doctor has a copy of your medical records—but do you have a personal copy of your medical history? Probably not. Like most people, you may feel that leaving your health records with your doctor is the safest and best place for them to be. But if you change doctors, move to a different city, get sick while traveling, or if you find yourself heading unexpectedly to the ER at the hospital, having your medical records with you could significantly boost your chances of getting the right care quickly. Both of these factors are very important for your chances of recovery—particularly if you have ongoing health concerns. Any medical health professional that wants to treat you with the best possible care needs to know your medical history. They need to know what meds you are already taking and they need to know what health conditions you currently have. What’s more, having access to your own records could be an empowering experience to better manage your health. This is exactly what the U.S. Department of Veterans Affairs found out when they allowed patients full access to their records, including clinical notes and medical imaging results. You can build your own version of a health record by jotting down some personal and medical information and keeping it in a safe place (let another trusted person know where this safe place is, too). • A list of major health problems you’ve had in the past such as a broken bone, pneumonia, or surgery. 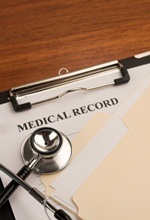 You can ask your doctor’s advice about making a personal health record. If you’re comfortable using software on the computer, you can purchase a copy of a program that creates a personal health record for you. Just enter the data and the software will help you organize it. Some of these programs also link you to apps that can monitor your medication use and assist with managing blood sugar readings if you’re diabetic. Woods, S.S., et al., “Patient Experiences With Full Electronic Access to Health Records and Clinical Notes Through the My HealtheVet Personal Health Record Pilot: Qualitative Study.” J Med Internet Res. March 27, 2013; 15(3): e65.